Somewhere that empowers you to directly support your favorite artists, performers and creatives, while having fun! Simply do what you always do anyway! Interact, 'consume content' and just generally socializing online with friends, fellow fans and other like-minded people who support the Arts and media, just like you. You'll also be a part of the circle of influencers and businesses within the Arts and media industry, who also directly support, promote and manage the career and work produced by these creatives. Through Pindify's unique framework, which includes the latest technologies, such as blockchain and cryptocurrency, you're in control of who, where, what and how your subscription (money) is distributed. This is just another way you are empowered by becoming a Subscriber to your Provider, through Pindify. Once Empowered as a Subscriber, You'll Discover, Organize & Connect directly to your Provider and their exclusive content Through the Marketplace. You also get access to other exclusive content on the marketplace, depending on your Membership Plan. And you'll do it all, online, through Pindify, without seeing a single popup, or ad! That's right! At Pindify, you subscribe to a Provider, via a unique Pindify invitation or via their Portfolio or Page, either way, it is the Provider that you Subscribe to. Pindify is simply the platform, the marketplace, the entity, that enables you to directly support your favorite creatives and their networks. Pindify connects you with the Provider. This empowers you. This also empowers the Provider. The impact this has on Providers of the Arts and media is immeasurable, including their ability to simply earn a living for themselves, as an artist or person who creates art or media, or even those that exist to support them. Win win, right? You want to 'consume' the content that these creatives create and produce, and they want to create and produce it for you! At Pindify, you're now able to see a direct line between you and the creativity you love. If a Provider has enough Subscribers within Pindify that follow them, and/or 'consume' their content (read about our framework in the FAQ (coming soon) ), then, at Pindify, they're actually able to earn the equivalent of a minimum wage. You're also empowered as an influencer yourself, not only on your Provider and their content, but on their Pages and Portfolios, whether it is their individual Page or Portfolio, or one that is 'co-owned' with other Providers. In shared ownership, any subscription revenue is shared between Providers. Discover new (& old!) arts and media content using the latest technology, explore the Pindify marketplace, browse and engage with unique and exclusive content provided to you by Pindify Providers and other Subscribers just like you, as well as free Pindify users who share non-premium content. Oh, and guess what else you'll soon discover at Pindify? There ARE NO ADS! That's right! NO ADVERTISING. Discover, just like you should: Ad-free! The way it used to be on the internet! That's another reason why you subscribe, right? So you don't have to see ads! Organize your interests, favorite Providers, songs, art, media or whatever you discover on the marketplace or through collaborating with your Provider or other users. Using Pindify's unique tools such as Stash and Library, together with tools that will feel familiar from most other social sharing, media and communication platforms, you can create your own cultural identity. Tools like Share, Pin, Comment and Like (which we call Love!) are all part of the basic functionality. However Pindify is SO much more, and we are constantly evolving! Get Connected with those artists you love, by being their Subscribers, or just Following and Loving their Portfolios, Pages or content. Create your own tailored cultural hub, or join an existing one. At Pindify, the power of tailored content, community loyalty, directly connecting with artists and other creatives, is put back in the hands of the people directly impacted: the creators themselves, and those that support them. That's you! Click on the area you want to read more about, or scroll down the page. Empower yourself and your favorite artist or provider of the Arts &/or media, simply by signing up to Pindify and selecting your preferred Provider from the list and subscribing to them. Then just consume their content or share it, and you'll be supporting them directly! To ensure your subscription revenue goes directly to them, all you have to do is accept their customized invitation and/or follow their Portfolio(s). You can even improve their rank in Karma (& your own! ), by 'loving' their content. Share with your networks and you're also empowering them and their work! Organize, curate and develop your own personal cultural world of the Arts and media by getting shared content from people you are 'United' with and who you have selectively connected with. Get updates from Portfolios you Follow, and lose that frustrating practice of other platforms who force feed you 'paid promoted content'. At Pindify, there are no ads! No pop ups, no advertising, unless it is from someone you have subscribed to, and they are promoting their own content. Find content with creative filters, smart searches or go directly to their Portfolios. Tools to help you further refine include pinning and stashing for your favorite portfolios and content. Discover exclusive content and Portfolios from all over the world or specific to your locality. Create custom filters to ensure you see content from genres, people and sources you prefer. Global interests? Great! Local only? No problem! It's all yours to customize. Want it all, but only in Punk? You got it! Get inspired from friends and curators who are creating tailored content, organized into searchable categories unique to Pindify. Or become an inspiration for someone else. Pindify is simply the tool for you to use. Think: the Messenger. Connect and develop relationships with your favorite artist or provider by Following them or Uniting with them. By doing so, you'll be eligible to get exclusive content. You'll also have the capability to message directly with Portfolios you are United with, if they have allowed it. On Pindify, the entire marketplace is a passionate community of like-minded people, who are all members for at least one of the same reasons. They want to empower the creators they love, or their work, or perhaps they want to support the bigger picture, which is the industry and business network for that creator. Most of all, Pindify Subscribers want to take control of their content use and ensure that their subscription contribution goes straight to the people who will benefit the most. The creators and those that support them. To make sure that every Portfolio has a chance to grow on our marketplace we provide you the power to help them earn a ranking measure called "Karma". The more you share, communicate and show love for their content the more their Karma grows relative to views and publications. Also as a subscriber you can grow your own ranking measure called Kudos, which will give you more power to rank portfolios karma. Comment on content that you love and become a great (kind) critic. Negativity will not be allowed. If you have something important to communicate you can always ask to unite with portfolios and message directly. Either repost or share content or portfolios to other social medias to help spread the love. Help providers of content reach your friends on Pindify or on other social media by sharing. Do feel free to provide context to why you love it and become an incubator of great taste. Pindify's vision is for Subscribers to be able to zoom in everywhere on the platform to indulge and consume the incredible and varied world of the Arts and media, simply by filtering location, quality, mood, subject and categories. Also, directly connect and receive social and exclusive content from their favorite providers. One of the strongest powers of making content meaningful, is curated suggestions, songs, referrals and recommendations from a trusted source. We used to get them from friends, when we swapped albums, created mixtapes, or just from talking at school, dances and sports events. Radio channels, magazines, journalists, bloggers and more still provide recommendations, but it isn't the same as it was a few decades ago. You hardly see reviews anymore, let alone album of the week, or charts, seem to be a thing of the past. At Pindify, we're reinventing these important ways to discover new music or other content from the arts and media market. Additionally, by providing creators, influencers and businesses with licensing and shared ownership of content (including through technology such as blockchain) we are allowing the focus to be put back on the work itself, as a standalone entity, rather than a disposable commodity that isn't given true spotlight and time to shine. Discover Portfolios that have gathered and organized content from individual Pindify Profiles or Pages. Portfolios range from a single artist, writer, or podcaster to a label, magazine or radio channel. Connect socially but at the same time consume the content that your favorite portfolios publish. You can filter the portfolio to find audio, video, image and text to get the most out of you subscription. Pindify is global, but also respects local markets. View content published by Portfolios from your local area, mixed in with the published global markets published by Portfolios with a ranking of 20 or more in "Karma". To make your market, home & Portfolios accessible and easy to work with, we provide you with the possibility to pin content and Portfolios that you like. Once they are pinned, you can filter them out of search results or find them in your Portfolio or stash. Once you find content that you want to organize into a cue or list, simply click on "add to" and select album, gallery, playlist, top list, related list or cue list. 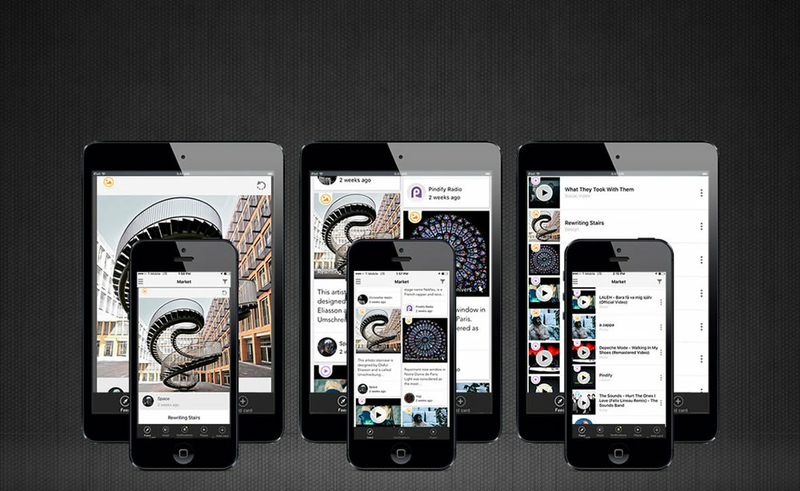 Get your flow of content on your home feed by following and uniting with Portfolios. This way you can find news from the market and updates at your home. Share and post with other Portfolios' to get that particular arts & media content connected again. Pin portfolios to have their content delivered & organized for you. This way you can keep up with the next release from a series of content. For instance, if you have a podcast you follow, simply go to your "stash" and select the pinned Portfolio and start listening. The search function finds direct searches of portfolios and content categories such as @Profiles, #Tags, *Media, +Collection, $Business and !Connect. You can select to filter by market, home, pins and history. The filter function provides results from bundled search and addresses categories, subcategories, mood, subject, era, location, date and time, tags. Once you have united with a profile portfolio you can message each other, not necessarily state of the art "AR" or "VR", but still a great way to connect on more of a personal level directly on Pindify. Pindify truly believe in the bond between the providers of arts & media and their supporters. We have this naive theory that by providing the market place online that financially supports the providers, we can also make sure that you meet IRL. Pindify will look for opportunities to organize smaller venues with just the subscribers and the portfolios they follow. Pindify wants to make sure that communication between you and your favorite portfolios are connected. By following portfolio, especially as a subscriber you will be able to get exclusive updates while financially supporting them, a win win situation in our opinion. Collaborate with other fans and unite with each other to lift up your joined culture through the market or via your home feeds. Together you can empower the ranking "Karma" of great portfolios by creating and supporting playlists, commenting, sharing and loving their content.